Use your iPhone 7 / 6S / 6 safely in your car, van or truck with this small, neat and discreet Brodit Passive holder complete with a tilt swivel. I purchased this along with the ProClip, see my review on that for background. This is a super car cradle, easy to install and position vertically or horizontally using the tilting mechanism. It has soft felt inside where the phone is located. The phone fits snugly into groves which you can tell have been machined to fit the phone perfectly and hold is securely without any rattles while driving. 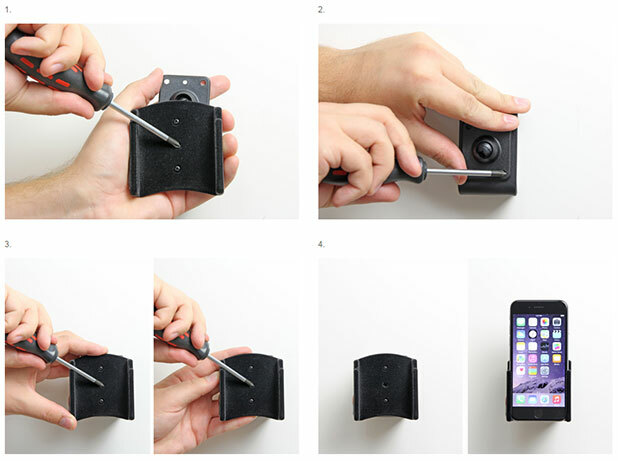 It’s easy to insert and remove your phone and with the felt covering does not damage of scratch your phone in any way. This is the second Brodit Car Cradle I have owned, why did I sell the other one when the only thing I would have had to change was the ProClip!, and having owned that one for over 5 years I can attest to the durability of the product. Delivery and that whole transaction using MobileFun was great with no complaints so I would have no hesitation in recommending them and the Brodit products. 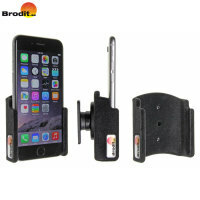 Prompt delivery of a Brodit iPhone car holder which was perfect and easy for me to install into my car. Included instructions should they be required. Will use this company again. Brodit make the best car cradles! A car cradle isn't the most exciting thing in the world to write home about, but the Brodit padded car cradles are the best you can buy! Phone fits snugly and securely, and It's easy to swap when you change phones (I've just swapped from an iPhone 5 and meant I could keep the car fittings all in place, and just had to swap a few screws). Highly recommended! The Brodit Passive holder is a secure in-car holder for your iPhone 7 / 6S / 6. Its lightly padded design ensures that your iPhone 7 / 6S / 6 doesn't get scratched when being used in the holder. The holder has an adjustable tilt/swivel base that allows you to adjust the angle of the phone to avoid light reflection. The open style of the holder leaves the charging port, headphone socket and speakers fully accessible. A charging cable can be connected to the iPhone 7 / 6S / 6 when it is in the holder. The Brodit Passive holder is designed to be easily fixed to your dashboard, either using a Brodit ProClip, or by screwing into the dashboard directly. This holder can also be attached to a Universal Suction Mount.